I then bequeath the whole of my property . . . to the United States of America, to found at Washington, under the name of the Smithsonian Institution, an Establishment for the increase & diffusion of knowledge among men. This simple sentence set the course for the world's largest museum and research complex, the Smithsonian, which consists of 19 museums and galleries, the National Zoological Park, nine research facilities, libraries, and archives. 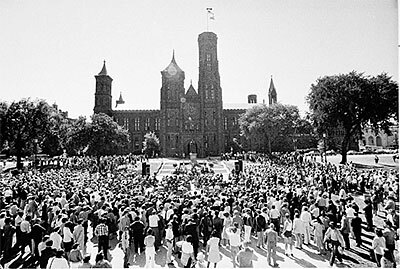 This exhibition looks at the history of the Smithsonian, focusing on its research; museums; and public programs in art, culture, history, and science, and the role of the American public in the Smithsonian's museums and research. The Smithsonian is a partnership between its specialist staff and the American people.